A labyrinth is not a maze. It has one way in and one way out. You cannot get lost in it. There are no dead ends. It is a symbol for life: It may seem chaotic but it moves forward steadily. As you enter please imagine how you are descending into darkness. A labyrinth has dungeon qualities to it. Ancient cultures have imagined all kinds of creatures in those caverns. It can be a dangerous and deadly place. Just like the path of life leads to death so is your way into the labyrinth. As you step in you step from light into darkness. The light fades away more and more the deeper you get into it. As you enter please imagine your journey as the challenges and hardships you face in life: the turns you are forced to make, the dirt you have to walk through. 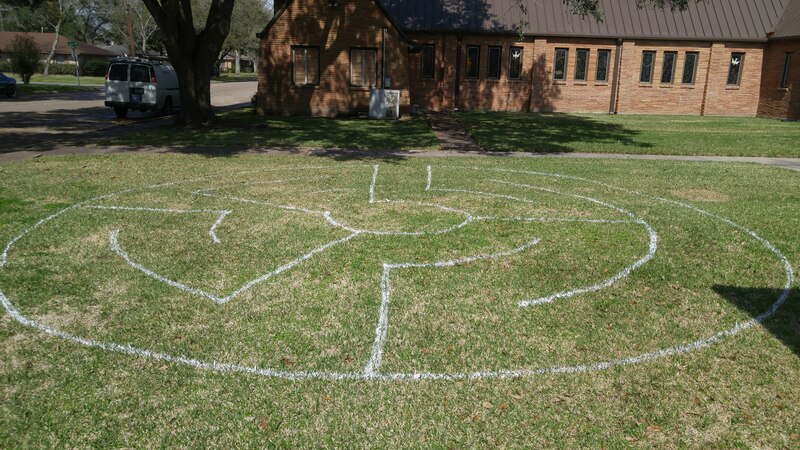 A labyrinth has a center. Once you are in the center stay there for a while. Rest. Celebrate your arrival. You made it through all of life’s troubles. If you are a religious person consider this the end state of your existence whether you call it heaven or Nirvana or however you name it. Maybe for you it’s just the great emptiness. When you are ready make your way out again. Take with you the strength of having been there before. As you walk out remember how you overcame all those troubles. After all you are walking back towards the light. Find signs of hope along your journey. Remember resources for personal strength that you can tap into. From my Christian perspective I call this part resurrection life. Out of death back to life. From darkness back to the light. This is a spiritual exercise. If you have an urge to walk really fast get some physical exercise first and come back when you are ready to walk slowly. This exercise works best in total silence. If that does not work for you right now please come back when it does. Find your own pace. Some of the images that may pop up along the journey may make you slow down, some may make you want to speed up and run away. Find your own pace, yet be mindful of others.